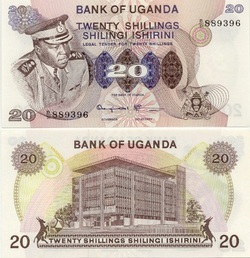 Idi Amin whose birth is guessed to be during the mid-1920s survived to 16 August 2003. He was the third official President of Uganda, from 1971 to 1979. Amin decided to join the British colonial regiment, the King's African Rifles in 1946 serving in Somalia and Kenya. He enjoyed a decent career with the British and then was eventually Amin was promoted to the rank of Major general in the post-colonial Ugandan Army. He became its Commander before seizing power in the military in January of 1971. It was in after that he deposed his former superior Milton Obote and took power for himself - He promoted himself to field marshal. He lived a lavish lifestyle while ignoring Uganda’s economic problems. 1967 - New constitution vests considerable power in the president. 1971 - Milton Obote toppled in coup led by Army chief Idi Amin. 1972-73 - Uganda engages in border clashes with Tanzania. 1976 - Idi Amin declares himself president for life and claims parts of Kenya. 1978 - Uganda invades Tanzania with a view to annexing Kagera region. installed as president, but is quickly replaced by Godfrey Binaisa. 1980 - Binaisa overthrown by the army. Milton Obote becomes president after elections.